Patience, Hope, and the Long Road to Recovery | Live. Love. Run. First, I have to say thank you to all of you who responded to my last post. I was overwhelmed with an outpouring of support from old friends, new friends, and those I’ve never met. Being a new mom, I have learned that a strong support network is crucial in order to keep your sanity. It is beyond helpful to hear others’ experiences and know that you’re not alone, that other people understand what you’re going through and that they made it just fine. Though I didn’t find the time to write responses to most of you, your words were so helpful, encouraging and so very much appreciated. Thank you! With that said, I am the happiest I’ve ever been. I am so madly in love with this little munchkin, and when I’m with her, nothing else in the world matters. Words cannot describe the joy I feel when I hear the playful little noises coming from her room when she wakes up, and I peak my head over her crib to see the sweetest ear-to-ear grin. Things have gotten easier, she’s sleeping longer through the night, and she’s gotten to the really fun stage where she smiles all the time and is communicating with us. I could go on forever about Daisy’s milestones and share the thousands of pictures and videos that we’ve taken of her, but this is a blog about running, and I’m here to share with you my road to recovery or lack thereof. Pregnancy is clearly very hard on the body. The fact that we have to push a 7-8 lb, 20 in. long BABY out of a very small opening is a miracle in itself, but it’s the other things such as the weight gain, weakened muscles, and loose ligaments that have plagued me since giving birth. The past few months have not been easy for me. I’ve been in a huge slump both physically and mentally as far as fitness is concerned. I tried running 2 or 3 times with no signs of improvement with my pelvis. Even going for a walk made it hurt. I started working again twice a week, and those two nights leave my body feeling broken, like I’m a 90 year old woman. My knees ache, my pelvis hurts even in my sleep, and I still get little twinges here and there from my long lost friend, the achilles. until yesterday. Months ago, I made an appointment with a specialist who I feel will really be able to help me. I anxiously waited for my appointment, which was supposed to be last week, but due to the nightmare with our healthcare system (thank you, Obama, for this “affordable” new health insurance that is almost twice as much as what we were paying before), we had to change our insurance (again) in order to see the doctors who I need to see. So I had to push my appointment back another two weeks. Having to wait so long to see this doctor is actually one of the reasons why I’ve put off all forms of exercise out of fear that I’ll do even more damage to my pelvis. My appointment is on April 2nd, and I am really looking forward to getting some answers and really starting this recovery. Tad, Daisy and I went for a walk at the park yesterday, and I probably walked about a mile and didn’t feel any pain. When we got to the car, I put the baby down (I was wearing her in my fabulous ergo baby carrier) and jogged (I hate that word) probably 400 meters with no pain. This. is. HUGE! Yes, things felt weird, my lower abdomen felt funky, and I felt like I had to pee, but I didn’t feel that horrible ache in my pelvis. Progress!!!! It was kind of a wakeup call for me. There is still hope, and I just can’t give up. I have to snap out of this funk and stop feeling sorry for myself. The longer it takes to heal the harder it’s going to be to come back, but there are little things I should be doing to make it easier for me like strengthening exercises for my achilles, weights, and I just have to grin and bear it and do some cardio in the gym. I know it’s going to be a long road to recovery, and this whole process has even made me change some of my future plans (stay tuned). I am so far behind my other friends and competitors my age, and every year that passes, I feel more and more anxious like time is running out for me. But in the grand scheme of things, I’ve got fresh legs and another good 10 years of training ahead of me. 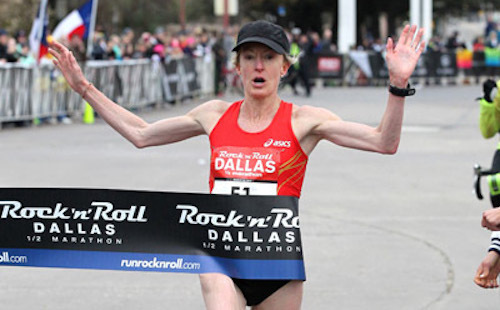 Deena Kastor is 41 years old and still winning races and making world teams. Kara Goucher is 35 and still making changes in her career and has plenty of room for PRs. The winner of the 2008 Olympic Marathon was 38 years old. I have to remind myself that there is plenty of time, and I just have to be patient. I know my time will come. This made my day and I really miss you 🙂 I’m going to email you on FB! Lauren!! I miss you too, buddy! Thank you so much for your sweet email. I will write to you soon! Keep your head up! It’s definitely hard to see our peers training hard, excelling and having fun, but you’re right… there is plenty of time and Kara/Deena are perfect examples. I kind of feel your pain, as I’ve been trying to get pregnant for over a year, have had to gain much more weight than I’m comfortable with and have had to stop all exercising. I feel like time is slipping away and I’m not even pregnant yet! I probably throw myself a pity party too often, haha. Before we know it, we’ll be doing big things, too! Glad you were able to run pain free, even if it was a short way. Can’t wait to continue reading about your journey 🙂 Good Luck at your appointment! Thanks, Heather!! I’m so sorry to hear that you’re struggling. I’ve been reading your blog to hear how things are going, and you totally had me fooled the other day with that pregnancy test! I wish you the best and pray that you get some good news soon! Hi! I think we’ve talked maybe once or twice when Nick (Collevecchio, my husband now) and I were in high school and came to your house 🙂 I read this because your Daisy’s picture is too cute and welcoming not to. First, I am not an athlete, but I do have a vested interest in my health and that has led me down all sorts of “crunchy” roads. We take our health really seriously here. I can say that I can totally relate to you…pregnancy and natural birth did a number on my body. I used to have prefect posture and now 16 mos later I can hardly sit up straight. I’ve had the aching pelvis and hips and lower back as well. 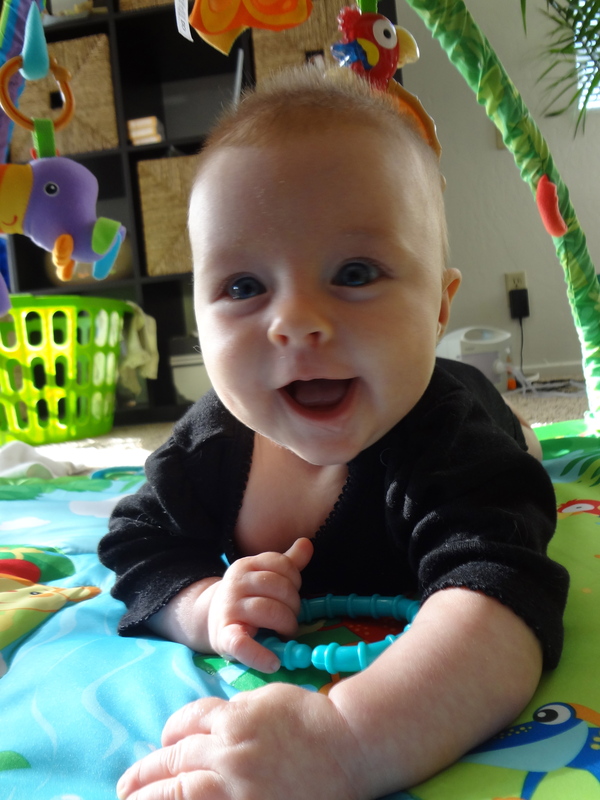 I think I *just* figured out my issue–diastasis recti. Have you checked your abdominal wall for separation after pregnancy? I’m about to begin a three part course to bring the abs back together. There’s an easy way to check and if you personal message me I can walk you through it. I felt compelled to write in case this could be something that might help you. Pelvic floor strengthening is important as well and a woman’s health physical therapist should be able to help you address both. Anyway, congratulations!! You’re doing amazing, this whole motherhood thing is wonderful and a journey. The first year is definitely trying. Remember to be easy on yourself as well, it took 9 mos for your body to get where it was when you had her and it may take that long to get back to “normal.” Best of luck! Congratulations on your adorable new addition! I found your website when searching for information about running and SPD, and just had to say I completely identify with what you’re going through, including the lack of desire to do anything in the gym. While I am nowhere near as fast as you are, I am an avid runner who developed SPD during pregnancy and am continuing to deal with it today, 7.5 months after my son was born. It’s been an extremely frustrating process, and I’ve concluded that the vast majority of medical professionals out there know nothing about this condition, much less how it affects runners. It is slowly, slowly getting better, though, and I remain optimistic that I’ll be back to running in a few more months. What I’ve learned through my research and through dealing with chiropractors, osteopaths, physical therapists, Pilates instructors, and body workers is the following: (1) a lot of it is about alignment, and chances are good your pelvis is misaligned; (2) the pelvic floor may be part of the problem too, so consider seeing a pelvic floor PT; (3) as another commenter noted, weak or separated ab muscles are a possible culprit; by strengthening them, you can better hold your pelvis in alignment; and finally, (4) have patience. Especially if you’re breastfeeding, things will probably remain loosey-goosey for a while. I know I’m hoping to see improvement when I wean my son in a few months. Anyway, I’m curious to hear what you learned from your specialist. I’m happy to chat more offline if you want to send me an email. Good luck!